That's what some Republicans want, and it wouldn't surprise me at all to see Democrats chiming in any moment now. 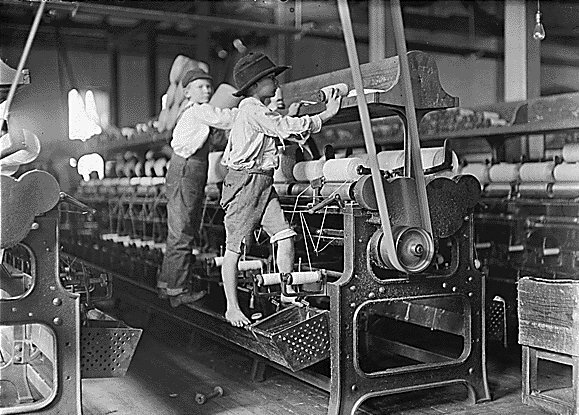 Employers would love to put kids to work at any and all hours, and the hell with school and all that other nonsense. If it weren't for all this education crap, they'd be ensured of an extremely low-paid work force with even less hope for advancement than there already is now. Last Friday I proctored an English Regents exam and the young woman in the seat closest to the door kept falling asleep. I had to keep asking her if she was OK, and eventually sent her out to wash her face and try to wake up. I asked her what the matter was and she told me she'd been working until 3 the previous morning. I told her her boss belonged in jail. She told me she worked in a catering hall. When I asked how old she was she told me she was 18. So I suppose her employer is not criminally liable. However, if this dirtbag could hire 16-year-old high school students instead of waiting until they're 18, I have no doubt the girl's younger friends would be joining her. Of course the girl's judgment is poor. But she's a kid, and I don't expect sterling decisions from teenagers. Her employer ought to know better. Parents ought to know better as well. Given the way this country treats education, it seems a national goal is to make sure no one knows better, except the billionaires who benefit from the exploitation of our children.